Converse have gone above and beyond, turning their classic Chuck Taylor shoe into a wah pedal for all those musos that find bringing both a wah pedal and a pair of shoes on stage far too much. 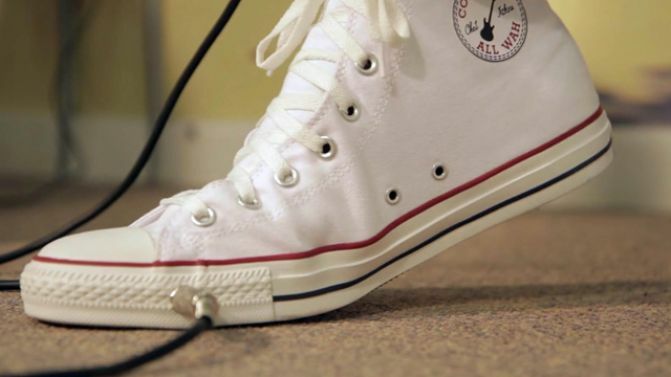 Titled the ‘Chuck Taylor All Wah’, the wah pedal has been built into the sole of the shoe meaning you can use it simply by moving your heel up and down. According to Pitchfork, the prototype for the shoe was presented back in 2013 by Critical Mass and has now been brought to life by Cute Circuit. The prototype had a few more wires but the finished product is wireless, meaning you’re free to stage-dive at your own will without be hoisted back. There’s a very nerdy video that explains how it all works but for those who don’t speak the tech lingo, there’s basically a sensor in the sole of the shoe that measures its movements which is communicated wirelessly to a wah-box. It can be connected to an amp and your iPhone or Mac. No word on when you’ll be able to purchase yet but J.Mascis has a pair and he’s featured in a video below testing them out.